My first experience with taiko was taking a beginner class with Emeryville Taiko. I loved how it immediately cleared my mind and made me forget about the day’s stresses. 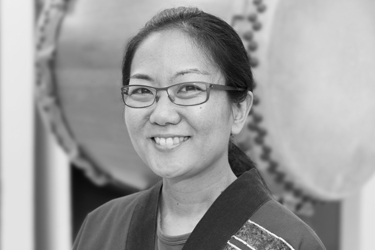 I drummed with Emeryville Taiko for eight years until moving to Portland. I played the flute in high school and have had some success at transferring those skills over to playing the fue. I also played the ukulele while growing up in Hawaii and would love to find the time to pick that up again. I am a structural engineer with the City of Portland. My husband and I started taking classes with PT in 2015 and we are now full members. We have a tuxedo cat named Picasso. Playing taiko is a fun way to not be a couch potato!